Be the first to share your favorite memory, photo or story of Mr. Lonnie . This memorial page is dedicated for family, friends and future generations to celebrate the life of their loved one. 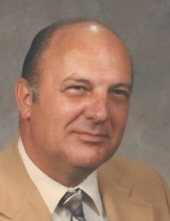 Mr. Lonnie Edward “Ed” Burkett, of Warrenville, SC, beloved husband of sixty-three years to Mrs. Mary Carolyn Beard Burkett, entered into rest peacefully, in the comfort of his home, on Saturday, April 6, 2019. In addition to his wife and parents, family members include his children, Carolyn Jayne Burkett Ogden and her husband, Bob, Douglas Edward Burkett and his wife, Angela and the late Sharon Dianne Suggs, brother, Robert “Bob” Hugh, grandchildren and their spouses and great-grandchildren. The family will greet friends on Thursday, April 11, 2019, beginning at 10:30 at Hillview Baptist Church, 1974 Jefferson Davis Hwy., Graniteville, SC. A Celebration of Life Service will follow at 11 o’clock. Pastor Donald Pope will officiate. The family has asked that in lieu of flowers, memorials be made to Hillview Baptist Church, 1974 Jefferson Davis Hwy. Graniteville, SC 29829. To send flowers or a remembrance gift to the family of Mr. Lonnie Edward "Ed" Burkett, please visit our Tribute Store. "Email Address" would like to share the life celebration of Mr. Lonnie Edward "Ed" Burkett. Click on the "link" to go to share a favorite memory or leave a condolence message for the family.